Home > 2016 > 05/09 > Is Dylan Larkin going to be the Red Wings’ next franchise player? Is Dylan Larkin going to be the Red Wings’ next franchise player? Let’s get some things out of the way, first. Dylan Larkin is fun to watch, and he had a productive, impressive first season in the NHL. He’s very fast and talented, as he showcased at the NHL All-Star game in February. Dylan Larkin might be a perfect marketable player in that he’s Michigan native, a likeable guy, and a huge rarity amongst the Wings organization in that he made the team as a 19-year-old. Dylan Larkin is perhaps the best young player Detroit has seen make the jump so quickly to the NHL in what seems like a lifetime (because for many of us, it is a lifetime). These things are all true. Dylan Larkin and the Red Wings when put together, are exciting. A near-perfect match, even, something against the status quo of what the fanbase and organization is used to, and if he didn’t singlehandedly carry the Wings to the playoffs this year, well, he definitely played a huge part. Dylan Larkin is the kind of player who can get you out of your seat, whose jersey you can buy for yourself and your kids, and who you’d buy a ticket just to go see. 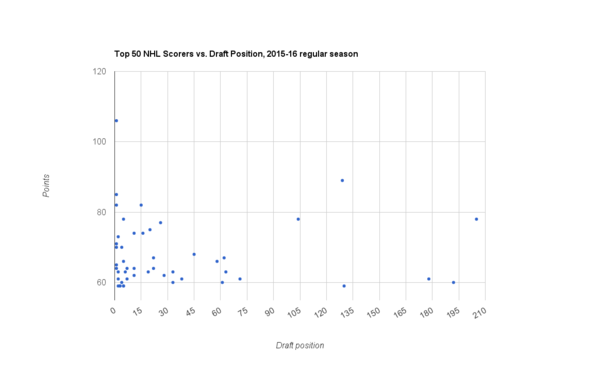 There are many different ways to predict how good a player will be in the NHL. One way to look at it is looking at a player’s draft position. For every hit at a certain spot, there are a number of misses, and the further down the board you go, the more frequent the misses get. This much is obvious. Larkin, at 15th overall, is the highest pick the Wings have had since 1991, where they selected 10th. The Wings this year, are set to be selecting 16th. The chart below showcases 48 of the top 50 point scorers from this year’s regular season. Some players on this chart are easy enough to spot. Jamie Benn, for example, finished second in the league in points as a 5th round pick, while Patrick Kane’s point total just trumps everyone else. But as you can tell, the largest cluster of dots sticks to the far left of the graph. If you’re looking to get a top-end scorer, you’re going to most likely want to be picking him near the top of the draft. At 15th overall, Dylan Larkin is right on the line between half the data amongst the top 50 scorers. 25 of the top 50 scorers were taken in the top 15 picks, while 19 of these were in the top 5. Doing some super simple calculations, that’s 38 per cent of the top 50 scorers in the league being taken with a top-5 pick, while just 14 per cent of those players (7) came from picks 10-20. These 10-20 picks date back to 2003. There have been 143 players taken in that range. (11 picks per year, for 13 seasons). 4.9 per cent of them are currently in the top-50 in league scoring. 95.1 per cent of them aren’t. Excluding the 2003 draft, where three of them were taken, we’ve got 4 out of 132 selections over the past 12 drafts taken from 10-20 to currently be in the top 50 in league scoring – a whopping 3 per cent. Just six players on this were taken after the 100th pick, and only 15 out of 50 in total were taken outside of the first round. The further you go down the draft, the harder it is to get an elite player. None of this is very groundbreaking stuff, and it’s a very incomplete, rudimentary study by looking at just one year of production at a raw point totals level. But there’s plenty of publicly available work on draft position value, which is summed up in a great article here by Shawn Reis over at The Leafs Nation. It really doesn’t take much math to know you’re much more likely to get a high-scoring player in the first 5 picks than the next 200 or so. In his own draft class, Larkin’s competing against names like Aaron Ekblad, Leon Draisatl, Sam Reinhart, Sam Bennett, William Nylander, and Nikolaj Ehlers, just to name a few. Sprinkle in players like David Pastrnak and Robby Fabbri… and he might get bumped out of the top 10 brightest futures within his own draft class, depending on where you rank him. Even though Larkin has shown that he’s a very good player with room to grow… there’s still many, many other young talents out there from the 2014 draft alone. Younger than Larkin, you get names like Connor McDavid, Auston Matthews, Jack Eichel, Mitch Marner, Dylan Strome, Patrik Laine, Jesse Puljujärvi… the list goes on. How many of those guys would you take over Larkin at this point? If the answer isn’t all of them, you likely need to have a quick reality check as to how much you like the guy, or have some info that’s fooling 99.9 per cent of the hockey scouting world. Simply put, the odds are stacked against Larkin to become that top-end guy. Solely based on draft position alone, there’s about a 95 per cent chance he won’t be among the game’s elite in an average season. He put up respectable rookie numbers. He also finished 122nd in league scoring. Among players 21 or under, he finished ninth in points per game. Ninth is respectable. But it’s not first or second or third or even top-five. Those are nine players within his own contingent who outperformed him – and there’s still many players in the draft yet to crack a regular roster spot. For Detroit, Larkin is special, there’s no doubting it. He’s something new, fun and different. Once you compare him to the rest of the league… he may be Detroit’s golden boy, but there’s several other players that will find larger stardom than he will. Before you start talking about Larkin developing into as a top-10, top-20 type forward in the league, ask yourself, would you really take Larkin over everyone listed in the paragraphs above? Consider how you see their futures on a one-on-one matchup with Larkin. Perhaps there’s a few battles there that he wins in the long run, but even still, it’s unlikely Larkin touches that upper echelon of players. That’s just a few names from only three years of drafts, so it’s important to be realistic when we’re considering Larkin against the league in the future. While he may be a big moment player, a fan favourite in Detroit for probably as long as he plays, will he ever be consistently elite? The draft position numbers point to – no, probably not. And that’s okay, really. Dylan Larkin’s ceiling is what it is, and a good rookie season that may have exceeded expectations on how quickly he’d translate to the NHL doesn’t change that a whole lot. In a 2014 re-draft, he might sneak into the top-10 talents, but there’s plenty of players yet to get his amount NHL ice time that will certainly put up more impressive numbers in the future. But, as I’ll touch on below, if the Wings want to be competitive, it’s not okay for Detroit to stay content, and accept Larkin as their best player moving forward, which is what it’s looking like right now might be the case. “The Wings two superstars were late-round picks” is the natural counter-argument to discussing average draft position and the Detroit organization. This is true. Pavel Datsyuk was taken 171st overall. Zetterberg was taken 210th. But it’s lazy to assume that what’s worked in the past will always work in the future. The truth is, Pavel Datsyuk may have played his last game as a Red Wing, while Henrik Zetterberg is 35, and on a steep decline with a heavy cap hit. Their days as true NHL stars are all but over, and it’s time to build for the future. Both Zetterberg and Datsyuk are Hall of Fame quality players. Everyone knows this. But what about every single other pick the Wings have had over the past, 20 years or so? The number of true superstar skaters drafted by Detroit besides those two picks is.. pretty much zero. The team’s picked up a few very solid players drafting in the mid-late first round and later, (or even trading away their first round picks), but the fact is, two largely lucky late round picks have remained the face of the franchise throughout the entirety of the 2000s, while the rest of their drafts, have uh, fallen pretty flat in terms of drafting top-end scoring talent. Over the course of his career, it’s hard to complain about what Kronwall’s given the team. Consistent ice-time, big hits and solid-two way play. Kronwall also made zero all-star games in his career and never finished in the top ten in Norris voting. Really good defenceman? Sure. Top-end talent? Not quite. Filppula had a career season of 66 points with the Wings. He also had five full years under 45 points, before his move to Tampa. Hudler probably had the largest ceiling out of these five, putting up a career high of 76 points with the Flames. But in Detroit, Hudler peaked at 57 points. He literally never played a game for the Red Wings, so he doesn’t really count. Franzen playoff hero in 2008 and 2009 with his high scoring totals. He also peaked at 59 regular season points. All five of those players were good players and good draft picks, but none of those players were ever anything more than just a “good player” in Detroit. From ALL their draft picks selected from 2000-15, the Wings have had ONE single season above 60 points in Detroit- Filppula’s 66 in 2011-12. Larkin might be the most likely to be next in line to do so. But 60-points makes you a very good player, not a great one. In today’s NHL, you can’t win the playoffs without multiple good scorers. Every single team that made it to the second round in the playoffs has at least one 60-point scorer – and seven of those eight have at least two. Is there anyone else the Wings have who could be a star? Since 2011, the Wings have had just three regular roster players from this season drafted: Larkin, Andreas Athanasiou (even debatable if he counts as a regular), and Tomas Jurco. Three. The Wings have been lauded for the Zetterberg and Datsyuk picks for years, but the truth is, those two are outliers, not the norm. Those picks happened in 1998 and 1999, if you needed a reminder. Right now, who else in the Red Wings system, (or on the NHL team) do you see as being better than Larkin in the future? Anyone? For example, Tomas Tatar and Gustav Nyquist, arguably the Wings’ two most proven forwards past #13 and #40, are turning 26 and 27 this season, respectively, right around the age most players peak. Their chances of becoming star players at this point are quite low – and you could make a case Larkin’s already better than them. Take a look at the Hockey’s Future prospect rankings for the Red Wings from earlier this season. Sure, it’s one source. Take it with a grain of salt if you want. But the fact is, there is not a single Red Wings prospect with higher than a “C” probability of success. Disagree if you like, that’s fine. Perhaps you think the rankings are a little harsh. But it’s hard to argue there’s little that inspires hope in regards of finding a true star offensive player in the Red Wings’ available resources. You’re not picking from top-5, or even top-10 picks. The Wings prospects are littered with late first-round guys and even later. Two prospects near the top of almost everyone’s board are: Evgeny Svechkinov and Anthony Mantha. Svechnikov has had a very solid QMJHL season, sitting sixth in the league in points per game with 1.58. Mantha, for whatever reason, has struggled to stick at the NHL level, despite a strong junior year. Is either player going to come in and be the leader of the team in the future? You’d be pretty hopeful in thinking so. Both are solid pieces, but either “the guy?” Unlikely. The only other young guy who could realistically become a true top-end player is Andreas Athanasiou. He’s shown that maybe he can, ranking 13th in the league in 5-on-5 points/60 minutes of ice time this past year. But we’re discussing a player with 37 NHL games under his belt four years removed from his draft year. No fault of his own, maybe, as for whatever reason, he couldn’t crack the lineup for much of this season. But as good as he was this year, it’s an awful lot to bank on any of these three to become a truly elite player. Are they going to be good, long-term NHLers? It’s possible, maybe even likely. But “maybe” is all the Wings are filled with right now. A whole lot of maybes, and few sure things. Larkin might be the surest of those things, but even then… how good will he really be? What if Larkin does become consistently elite? Let’s say, hypothetically, Larkin fights the odds, and becomes a consistent top-20 scoring forward in the NHL within the next few seasons. Perhaps you don’t care about the predictability of draft position at all, because it’s predictable about some things, but then again, like we mentioned, there’s still a respectable enough chunk of scorers drafted outside of that top-5, top-10 range that landed in the top-50 this year, and a few near the top 20. To become that consistent, top-20 scorer, let’s say he’d have to be good enough for say, about 70 points on average, with a few 80-point seasons sprinkled in. In today’s low-scoring NHL, that’s about as much as you can ask for. Very few players in the NHL fit that category, but the ones that do are the cream of the crop. This year, just 17 players topped the 70-point mark. Last year, it was 19. Of the 17 players to score 70 points this year, 47% (eight of them) were picked in the top-5 in the draft. In this absolute best-case-scenario, Larkin, the 15th overall pick, rises to the top, and somehow beats out much of the 2014, 2015, and 2016 draft classes and becomes Detroit’s go-to guy in the future, putting up 70 point seasons like it’s nothing. That’s wonderful for Detroit. In this dream scenario, Detroit has an elite scorer in Larkin, Michigan born and raised, team captain and legend. It’s everything a Wings fan could ask for. But then the question shifts to, what else do you got to back him up? The thing is, the Wings really don’t have a great group of supporting players, now or in the future with the assets they have. Take a player like Phil Kessel in his Toronto days, John Tavares for many years in New York, or Erik Karlsson right now. All three were unquestionably the best players on their teams. None of the three ever had any real team success. And even if Larkin does reach that top tier of player – there’s a very good chance he gets left out on an island, so to speak, with little depth available to the team right now or in the future. That’s what Detroit’s looking at right now in their future — and that’s if Larkin turns out to be a player of that calibre. If not, they’re looking at having no real stars in their system – and a relatively low chance of picking one at their current draft position. Let’s temper our expectations of Larkin a bit from elite player to good player. Let’s say Larkin peaks at say, an average of 55 points a year, give or take 5 points. That seems doable enough, considering his first year in the league. Looking at this year’s numbers, 60 points puts you in the top-40 in league scoring. Very good. Not “retire your jersey” good, but at least strong enough to be considered an offensive force. If Larkin is the Wings best player moving forward and barely reaching 60 points… you can easily see how that could be a problem. Simply, they’d need remarkable goaltending and defence and extremely well-rounded depth scoring to succeed. Or, and much more likely, they need someone at least as good, and probably better than Larkin to be truly competitive in the NHL. In the long term future, they don’t have that. I can’t see the Wings being competitive building with only mid-first round picks and later for much longer. Eventually, they’ll need to either trade up to a top-10 spot… or get there by losing, and *gasp* missing out on the playoffs. If not from the top of the draft, where do they get their next superstar? Free agency? Trade? Because since they picked Zetterberg in 1999, picking 15th or later every year, they haven’t drafted a single one. They haven’t really even drafted many strong offensive forces. One season above 60 points in Detroit. One. And he’s playing in the playoffs right now for another team. This isn’t a critique of Larkin — it’s far from it. Larkin has showcased plenty of skill at the NHL level, and fits well in Detroit. He’s perhaps the best draft pick in a generation in Detroit. But that’s exactly the problem here. He’s got an incredibly bright future as a very good NHL player, but he’s only one guy — and there are many other players coming into the league (not to mention already in the league) who will be better than him. If he’s set for superstardom, he’d be an anomaly and fight the expectations, rather than continue on his projected path. If he does continue as projected to a good-but-not great player… well, the Wings really need to find a good way in getting someone else. And trading into a top-10, top-5 spot will significantly increase their chances of doing so. If the Wings are planning on getting their future best player through this year’s draft – 16th overall isn’t always a great place to do so. It’s possible. But it’s a hell of a lot to bank on, as we looked at above. There’s always a chance you can get a franchise-changing player midway through the first round. But it’s much more likely you won’t. As a Flames fan, kudos to the Wings for still finding at least decent scoring 50-point scorers past the first round all these years. They haven’t unearthed any superstars since Datsyuk and Zetterberg, but their record in finding good support players (first Filpulla, Franzen and Hudler, and more recently Tatar and Nyquist) is still above almost everyone else. I would put Larkin’s ceiling very much higher than his value as a 15th pick. Whether he becomes truly elite, as you say, or not, is tough to say. If he does become that 70-80 point player, and one of Evgeny Svechkinov, Anthony Mantha or Athanasiou develop to become a 60-70 point player (not out of the realm of possibility based on their potential), you have a solid 1-2 punch there. Let’s not sleep on Tatar or Nyquist either, who have proven to be at least 50-point guys. And as the Wings love their late bloomers, they are still young enough to perhaps go up another level. That may be optimistic thinking from an outsider, but as Tampa is showing without their superstar, sometimes depth and a bunch of high-perfoming lower-drafted forwards (I know Hedman was drafted high) can inflict a lot of damage.